In typical dental settings, patients feel threatened by the surrounding environment. They may struggle to sit through a visit, and might make the appointment difficult for the parents or caregivers, too. 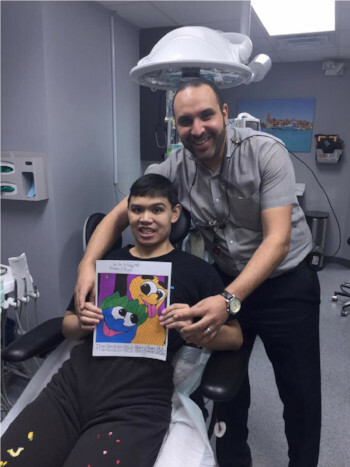 Patients with Autism Spectrum Disorder, Attention Deficit Hyperactivity Disorder (ADHD), and Asperger’s Syndrome are not typically able to sit in the dental chair for long periods of time. However, they need diligent preventative measures and occasional procedures, just like everyone else. Dr. Mady has dedicated his practice as a safe haven for all of his patients, especially for those who need additional attention or who have had poor experiences with dentistry in the past. A Non-Threatening Consultation: The initial consultation will take place in a comfortable non-dental room. The patient will enjoy a safe first appointment with no commitments. A Gentle and Customized Dental Assessment: Dr. Mady will complete a full medical assessment of conditions, all while getting to know the patient and catering to their unique needs. Personalized Plan Development: Our compassionate team will work alongside you and your loved one to develop a personalized sedation and treatment plan. Together, we can discover the best way to make the patient feel valued, comfortable, and safe. Mild to Deep Sedation Options: At the Center for Dental Anesthesia, we are trained to administer a wide variety of safe sedation options. These sedation dentistry options allow our team to complete more dental work in a shorter period of time without any discomfort or difficulty for the patient. Highly Skilled Team: Our dental and medical professionals are exceptional, and will provide proper patient management before, during, and after the procedure. Post Procedure Spa Recovery Rooms: Sit back and relax in our spa recovery rooms with full monitoring capabilities. We want all of our patients to enjoy clean, healthy, and beautiful smiles. You can change dental phobia into an enjoyable dental experience in an instant. Just make a quick call to the Center for Dental Anesthesia today!